CMYK is one of many new Patcraft introductions designed to elevate the built environment through the use of color. Patcraft, a leading provider of performance flooring solutions, has introduced its latest colorful resilient tile collection, CMYK. This visually textured LVT tile features a smooth, high-performance surface that furthers Patcraft’s mission to help designers transform spaces within the built environment. Available in 12” x 24” tiles, CMYK is offered in a range of 24 vibrant colors and versatile neutrals tones to support branding, wayfinding, color blocking and mixing vision. CMYK’s 12”x24” planks feature a 20 mil wear layer. This highly flexible and durable product is treated with Patcraft’s ExoGuard+TM top coat offering industry leading scratch resistance, improved ease of maintenance and polish optional maintenance. 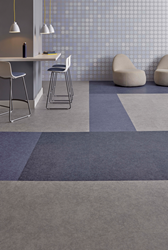 Part of Shaw Industries, Patcraft is a leader in high-performance commercial flooring, delivering performance carpet tile, broadloom and resilient with innovative design and superior service to meet the needs of every market sector.